So, you having fun yet? : When _______ Ruled the Earth! When _______ Ruled the Earth! I've been thinking a lot lately about this banner from Jurassic Park. (It says, "When DINOSAURS ruled the EARTH.") Because when they were around, they sure did rule. Basically everything was either food or ignored. Now you might say it's the time When HUMANS rule the EARTH, because our population has exploded and our actions affect every other organism alive. But there was a time when neither we nor the dinosaurs were here to push the others around. Before the Age of Dinosaurs (the Mesozoic Era, roughly 250 to 65 million years ago, mya), there was the Age of Fishes (the Devonian, about 416 to 360 mya), which was followed by a time when tetrapods (four-legged creatures) flourished, and preceded by a time when all sorts of crazy invertebrates wandered the sea. In fact, the story of (animal) life on earth is really a series of incredible diversifications followed by great extinctions. At the end of the Permian (250 mya, also the end of the Paleozoic, and the beginning of the Mesozoic), there was a great extinction--the largest of 6--known as the Great Dying, in which over 90% of marine species and 74% of terrestrial vertebrate species went extinct.This was pure disaster for most species, but a small number (like the Lystrosaurus, below) survived it, and without much competition, they flourished. From these beings, dinosaurs (and mammals, and modern fish, and everything else that is alive today) descended. Incidentally, there was another great extinction 200 mya, which wiped out most of the amphibians alive at the time, making more room for the dinosaurs to rule. Of course, the dinosaurs diversified into all the different kinds we know and love today, but they didn't have such a great time when that asteroid the size of Texas hit the earth 65 mya and destroyed much of the vegetation they needed to survive. But once these terrible monsters were dead and buried, small mammals had little to worry about. They ran around with nothing to fear. Some dug holes and became rodents, others climbed trees and became primates. 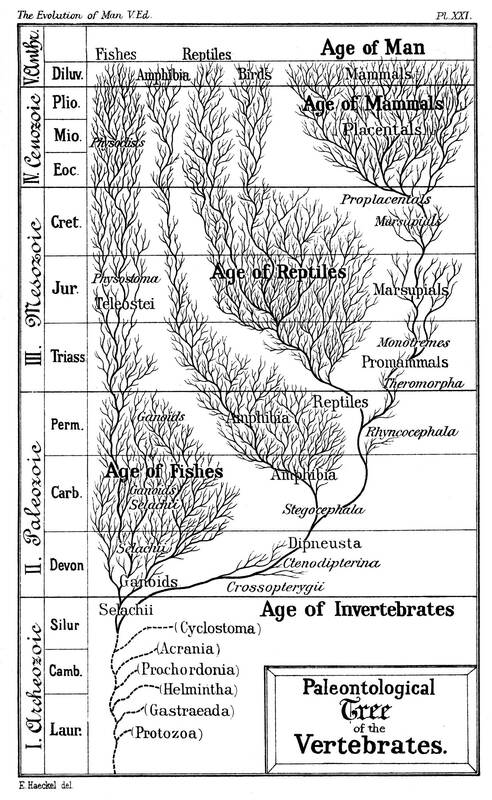 If you tried to draw the tree of (animal) life on earth, it would look something like this early one from Ernst Haeckel, with invertebrates at the bottom, then as time goes on (read up), there are tons of kinds of fishes, then at the end of the Permian, many of their branches end. In the Mesozoic, reptiles flourish, but then at the end of the Cretaceous, BAM, all that's left is turtles and birds. Finally, at the top, tons of mammals. I'm not going to pretend you don't know that we're in (causing) the 6th great extinction. Many larger animals have already gone, partially because of the hunting, exploration, and development of the last few centuries, but also because of the habitat loss (read: plants go extinct too). But what's next? Will humans be part of this great extinction? Will we make room for another great domain of animals? Or will we survive in smaller numbers and with a smaller impact, like the reptiles and fishes?